Most road signs in Israel are in Hebrew, Arabic, and English. 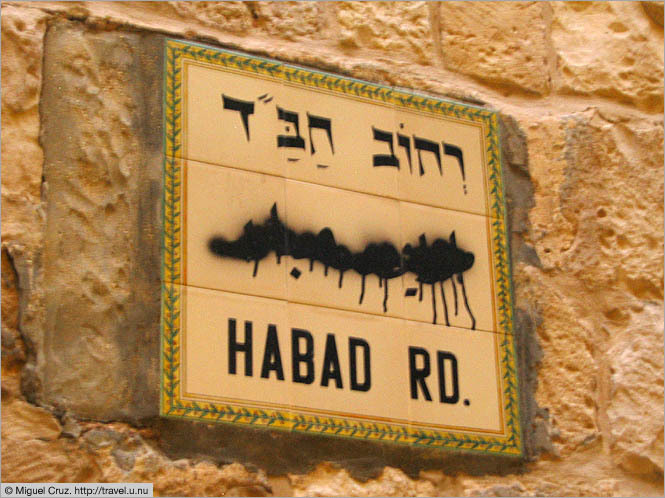 However, in the Jewish quarter of the old city, the Arabic part was often scratched or painted out. The Jewish quarter had some very interesting architecture, by the way, and I wish I had been able to capture it with the camera. Modern buildings, clearly from the past 5 or 10 years, faithfully followed the old patterns of mazelike pedestrian streets, organic angles, and traditional materials. It was very cozy and well done, and could possibly make an interesting model for urban development projects elsewhere.